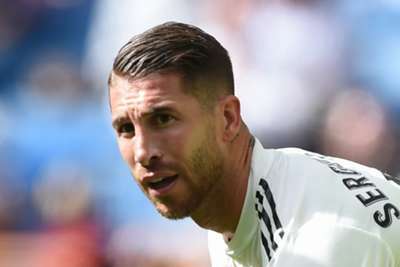 Real Madrid captain Sergio Ramos called for unity as reports indicated head coach Julen Lopetegui could be sacked after another LaLiga loss. Madrid went down 2-1 at home to Levante on Saturday and have now lost four of their last five matches in all competitions under Lopetegui. Ramos previously said it would be "crazy" to dismiss the coach, who was fired by Spain after his Madrid appointment was announced shortly before the World Cup. And the Madrid captain has again given his backing to the under-fire coach, with Lopetegui's future in doubt ahead of next Sunday's Clasico against Barcelona. "It's a very bad run that Madrid cannot afford," Ramos told reporters. "Not picking up the three points, today the team gave everything but at other times we have had more luck. "Individual mistakes have condemned us but we should not point the finger at anyone, the only way to turn this around is to be united. "Lopetegui is a very motivating person, he convinces, and we have to believe, he is the first to believe, we need unity. "If I am asked for an opinion, I give it, but I do not think that an opinion of mine could influence such an important decision as the coach's continuity." Barcelona beat Sevilla 4-2 later in the day to end their own poor run of form, moving four points clear of Madrid ahead of the Clasico – which will not feature Lionel Messi after he fractured his arm on Saturday. But Ramos' fellow Spain international Dani Ceballos is also backing Lopetegui to turn around a dire situation for the LaLiga giants. "I don't think this will cost Lopetegui his job," the midfielder said to beIN SPORTS. "We're with him to the death, but it's not my decision. "The sensations are bad. This game we had to win, 100 per cent. We came from some bad results and we could not slip up. Now we have to start thinking about Tuesday's game [against Viktoria Plzen in the Champions League]. "Their goalkeeper was the man of the match but what we have to do now is think and reflect about what we did wrong. We have to get goals to turn things around."